The quality of well water in the Woodlands. Rex removing a water buffalo in 2012. Rex Energy is now locked in a battle for its survival. The company declared chapter 11 bankruptcy in May, but not before quietly sweeping a nagging issue under the rug. As you probably know, Rex contaminated the water supply in the Woodlands of Connoquenessing Township in early 2011. Residents have been fighting the company for years to either replace the water supply or compensate them for their damages. Rex has fought accusations that it was responsible for the water contamination for more than seven years, but a group of Woodlands residents banded together and sued the company for their hardship. After years of resistance, Rex quietly settled with eight property owners without going to court. The settlement came in April, the month before Rex filed for bankruptcy, and netted the suffering Woodlands residents a whopping $158,875 to split between eight families. Recently released publicly available federal bankruptcy filings reveal that families received between $11,750 and $27,125 from Rex, though the recipients are not identified due to the terms of the settlement. Both the residents and Rex are bound by a non-disclosure agreement and are not permitted to publicly discuss the suit or the settlement. But while some Woodlands residents benefited at least a little from the settlement, many others are left feeling unsettled. According to other residents, some property owners with impacted well water were never approached to join the lawsuit when it was first filed years ago, or they signed a document but never heard any more about it. Though those who received money will hardly be able to completely replace their water supply, those who did not are in an even more desperate situation. Some can afford to have water buffaloes filled for $200 a month by the Oneida Valley Volunteer Fire Department, the only department who will deliver water to the Woodlands due to the poor condition of the roads in the “resort community.” Even so, this water is not potable, so many still rely on the “water bank” operated by the White Oak Springs Presbyterian Church for drinking and cooking. Rex thinks that they’ve finally gotten rid of those pesky Woodlands residents by paying them a pittance compared to their more than seven years of suffering. And it should come as no surprise that Rex chose to settle out of court, without the presentation of evidence that could have proved its guilt in the water contamination case. They think the issue is over, a done-deal, with both sides bound by a non-disclosure agreement, ensuring the truth will never be known. These people have been abandoned by their township, county, and state governments, left to fend for themselves against a powerful and influential corporation. Each year, counties and townships receive impact fees collected from fracking companies like Rex under Act 13. This year alone, Connoquenessing Township received $182,400.59 in impact fees, and Butler County government received $2.1 million. In the past, this money has been used for things like sealing cracks in public swimming pools, purchasing road equipment, and other things that have nothing to do with impacts of the fracking industry. For seven years, a real and profound impact of the natural gas industry has been ignored in the Woodlands. Public water could be provided to the residents of the Woodlands with less than half of the impact fee money the county received in 2018, yet both the current and former board of commissioners have refused to do so, as have the Connoquenessing Township supervisors. You can be guaranteed that if the Woodlands was full of $300,000 or $400,000 homes like the Timberlee neighborhood less than a quarter of a mile to the north, the Woodlands would not have been without water for seven weeks, let alone seven years. Let’s call the situation in the Woodlands what it is. This is a complete and shameful moral failure, on the part of Rex Energy, of Connoquenessing Township, of Butler County, and of the Department of Environmental Protection. The people of the Woodlands are living in their own third-world country. I thought America was supposed to be better than this. WINFIELD TWP—Construction has begun on a compressor station located at 827 Winfield Road, just east of Bear Creek Road. The owner of the 107-acre former farm, Pine Run Midstream, began construction of the facility earlier this month after receiving conditional use approval from the Winfield Township supervisors. CONNOQUENESSING TWP—Embattled Rex Energy received three violations for an incident on its Bloom well pad on Whitestown Road. 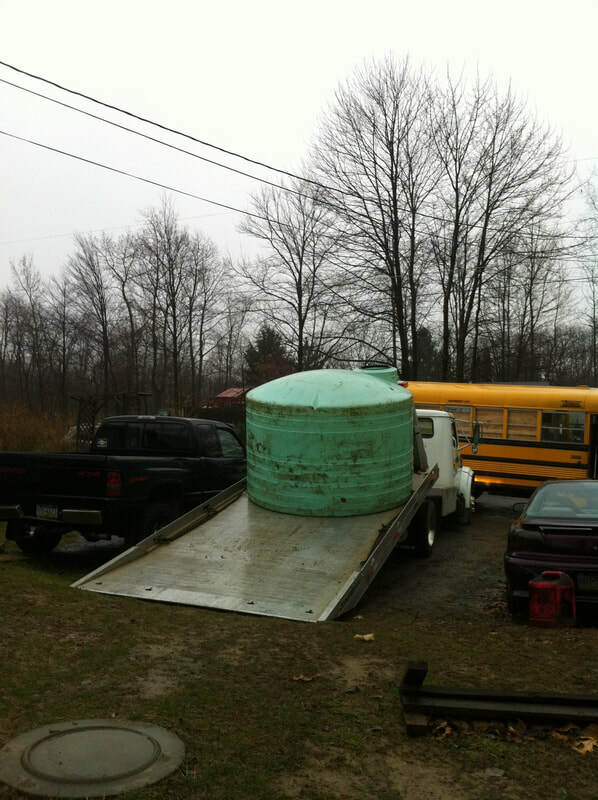 According to the DEP report, 10 gallons of a residual waste was spilled while being loaded onto a truck. The company was cited for disposal, processing, and storage of residual waste; management of residual waste; and unlawful conduct violations. WINFIELD TWP—Two new well pads have been permitted in the township. PennEnergy received one well permit for the W56 well pad directly off Route 356, just south of Winfield Road, on June 21. PennEnergy received another well permit for the W57 pad just south of the post office in Cabot, off Darby Lane. JEFFERSON TWP—PennEnergy received six well permits for a new well pad on Golden City Road. The W70 pad was permitted on June 27. ALLEGHENY TWP—EdgeMarc Energy received a permit for one unconventional vertical well on the new Lacerta well pad located south of Slater Road and west of Maple Furnace Road. The permit was issued on July 3. PARKER TWP—EdgeMarc was granted two well permit modifications for two wells on the existing Monoceros pad on West Eldorado Road. The modifications were received on July 11, but the pad was permitted and constructed in May. On July 19, one unconventional vertical well was permitted on the Cepheus well pad a little over a mile away on the same road. BUTLER CITY—A coalition of groups, including Marcellus Outreach Butler, Veterans for Peace, and Stop Banking the Bomb, protested in front of the PNC Bank branch on South Main Street on July 27. They called on the bank to stop financing projects like fracking, the Bayou Bridge natural gas pipeline in Louisiana, and nuclear weapons research. PITTSBURGH—Young people filled the streets of downtown Pittsburgh on July 21, calling for action on climate change. The This Is Zero Hour Youth Climate March was held as a sister march to the national one taking place in Washington, D.C. the same day. More than 75 high school and college students, plus other twentysomethings as well as older supporters marched from U.S. Senator Pat Toomey’s office down Grant Street to Mellon Square. Along the way, they stopped at the offices of Allegheny County Executive Rich Fitzgerald and Mayor Bill Peduto to call them out for their inaction on climate change. Speeches were held in Mellon Square, and several environmental organizations, including MOB, were there tabling in hopes of engaging a new generation of activists. The event made national news with a brief in the “State-by-State” section of the July 24 edition of USA Today. Read more about the march here. HARRISBURG—The DEP is considering updating its environmental justice policy for the first time since 2004. Per the revised policy, any U.S. Census block group, rather than the previous Census tract, with a 30 percent or greater minority population or 20 percent of people living below the poverty line will become environmental justice areas. Permit applications for things like landfills, coal mines, and power plants in these areas automatically trigger more scrutiny for issues like air and water pollution and the potential impacts on residents. However, oil and gas wells and associated infrastructure will not be subject to environmental justice (EJ) review. That’s because state law requires the DEP to act on well permits within 45 days, leaving no time for an in-depth EJ review. But wastewater injection wells will be added to the list of “trigger permits,” according to DEP secretary Patrick McDonnell. Read more here.